Rounding the corner on my Stopover. The finish line awaits, with the following obstacles in my way. Colorwork yoke. Ready, willing, able. Short rows. The mighty power of the Bang Out a Sweater forum lifts me up with confidence that I can in fact add two or three short rows so that the neckline will sit well. Sewing up the holes under the arms. Cannot wait to kitchener those stitches, and here’s why. It is a grand total of 18 kitchener stitches. Nine for each sleeve hole. A pair of socks requires more than that. It’s just not that much. I get your idea of a three-needle bindoff for these stitches. You make a fine case, Kay. The added bulk of the seam in there doesn’t really amount to much. I like the way grafting a batch of stitches creates one of those perfect moments in knitting: a stretch of fabric seamlessly merges into another one. Inexplicably and mysteriously. I live for this stuff. I learned to kitchener back when Knitty was young. Theresa Vinson Stenersen, I think about you and your awesome 2004 kitchener tutorial more often than you might think. “Front needle: knit 1, drop. Purl 1, leave. We’re all just looking for a groove wherever we can find one. For me, kitchener is one of those weird things that really makes a day worth living. 18 pages of In Style magazine. 18 NYT crossword puzzle clues but then I give up. 18 years of waking up boys. 18 minutes making a creature out of yarn and pipe cleaners. I’m with you on the Kitchener stitch. I’m madly infatuated with it atm. I agree! The Kitchener moment is a magical moment. I marvel every time. I really love your little yarn guy (and the beautiful AC work behind him). Have fun with your Kitchener stitch! Thanks, Robin! 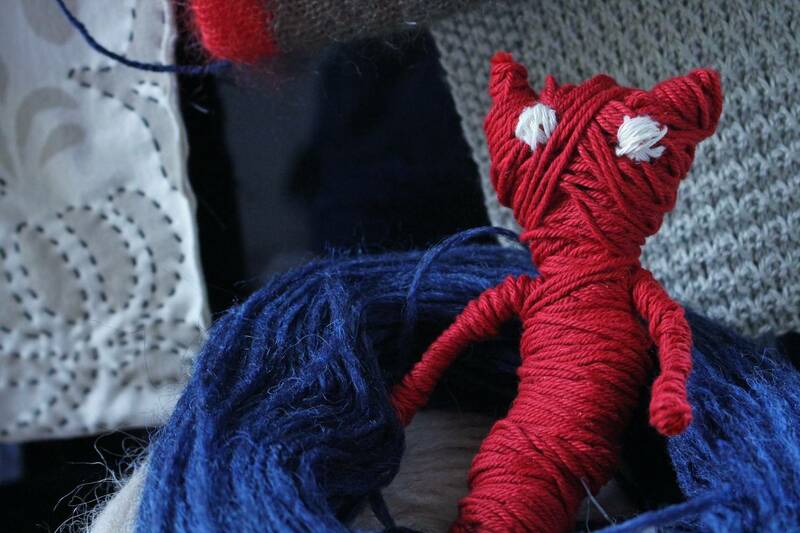 Yarny is, like, my Barbie now. I had a Midge. She was the Paula Prentiss of dolls. I knew she wasn’t nearly as cool as Barbie; I kind of thought Santa had it in for me. I never knew her last name was Hadley. What was Barbie’s last name? I always wanted a Midge but never had one! Definitely have some pent-up Midge love in me–need to cook up a cardigan for Yarny. Clearly you Kitchener better than I do. My results are only magical maybe 20% of the time. Trust me, I am a limping kitchenerer, but I’m a believer. I spent nearly an hour Kitchenering 168 stitches last night. I normally love it, but that was a bit much. 18 sounds much better. 168 stitches is like a dozen pairs of socks. What on earth were you doing??? Yes we must know. Can’t leave us in suspense with something like that. I love kitchener, too. I hear The Karate Kid’s Mr Miyagi in my head and “Knit Off, Purl on, Purl off, Knit on”. It lets me pick up stitches around a neckline for a hood, then kitchener along the top “seam” when it’s big enough. Whoaaa- was that knit up? Side to side? I’ve been banging out mohair cowls, inspired by Ann’s. Much kitchener…. That’s a use of kitchener I hadn’t considered. VERY cool. And those mohair cowls are such clouds of flurfiness. I like the small gauge of the stitches, too. A different use of that fine yarn. I have kitchenered a hood that way and the seam is truly invisible. I once rabidly knit a cape for my niece for Halloween. She was young, Halloween is her sister’s birthday (so you know she already felt a little left out) and she desperately wanted to be Christine from Phantom of the Opera. I knit that thing so damn fast that the lady who rode the bus with me actually started keeping track of it. And then I kitchenered the damn hood inside out so it had a big honking ridge. Not exactly the look I was going for. I love Kitchener too. Weaving a seamless join never ceases to amaze and thrill me. But I refuse to believe Lord Kitchener invented it. It must have been his wife or mother! I need to go read the history on this! I’m a Kitchener fan too and I also love the history. I also agree that I can’t imagine Lord Kitchener inventing it. I think he just got the honor of having the grafting stitch technique named after him when he was just trying to keep his men (the entire British Army) from getting Trench Foot. He died during WWI but lives on when we Kitchener the ends of toes and under arms of Stopovers! I find kitchener stitch meditative. Knit, off then purl, purl off then knit. I always think of the beginning and ending as half of a direction, begin with the end and end with the beginning. You can see how you can get very zen about it. I keep thinking about how I don’t really understand how those sewing motions create a knit stitch, yet it works. Trust the process! I always have to consult the instructions. But I agree it’s magic fun. Equivalent to blocking lace. That’s my other one. Another person on the side of Kitchener for reasons of the groove plus the stretch. Thanks for the reminder on the short rows on the back! Close to that moment. I imagine him in his tent, finishing up a sock and thinking, Good lord, I dread the seam I am about to create. Is there no other way? Yes, that’s an excellent image. I too have sat in a tent with a sock and had similar thoughts. Thank you. I am completely enamored by the kitchener stitch EVERY TIME. The magic is amazing. I want your stopover! That BLUE!! Did I tell you I have a blue thing? Beautiful! Me too! I have so many clothes in this shade. This Plötulopi shade is Winter Blue Heather, and it is so deeply pleasing to me that I made it the big picture on the blog today. It has a fair amount of black in it; I’d love one that’s even deeper, actually. I finished my Stopover last week and promptly bought more yarn in a different colorway to make another one. I love it! I am so surprised at how fast it turns into a sweater. Really satisfying! Why, I did not know that other folks had a Kitchener mantra! I’ve got one, too! I don’t remember it exactly now (long time since my last pair of socks), but Kitchenering means I am alone and saying the “mantra”outloud. It generally works like a charm. I am way behind on my sweater, can’t get past the fourth row (keep making mistakes); and, real job had been getting in the way timewise. I am keeping on keeping on, however, and will surely be one of the slog alongs bringing up the rear. No matter. BTW, yesterday’s contest made me focus on my “bucket list” of blankets (I even forgot to mention two more). That really made me feel good, so that I leven if I probably don’t win, I really did win something. May we all be granted enough time to finish the knits that live in our hearts! It’s definitely not something I attempt when anybody else is around, or the TV is on, or it’s past noon. It requires my FULL attention. The cat also needs to go outside while Kitchenering…SILENCE!, except the muttering part. Diane, I have finished my sleeves, but am still knitting on the body. (Had to rip out multiple inches a few days ago, due to an error I couldn’t fix “on the needles.” I hope to join the three tubes tonight or possibly tomorrow, so I am definitely also hanging about in the rear. I’m looking at the back of the knitting gazelles, too. I am always surprised when my kitchenering works. And I have a death grip on the needles like a pilot in a nosedive the whole time. As a lefty mirror knitter, it took some doing to find out how to make it look right. I turn my socks INSIDE OUT for it. Strange but true! I can’t believe I’ll ever be able to intuitively kitchener, but I also never believed I’d ever knit socks and now I have seven pairs laid out flat to dry. I kitchenered (is it a verb, too?) a kazillion stitches to finish a Churchmouse cowl pattern. It went on for days, but was worth it in the end. Seamless! Like someone inside the tube was doing the knitting. Thanks, Tammy! Eating my way to the next year! 18th comment? I’m with you, kitchenered the heck out of my underarm seams. It’s magic. I love kitchener stitch too, but must say, 3 needle bind off has its merits. 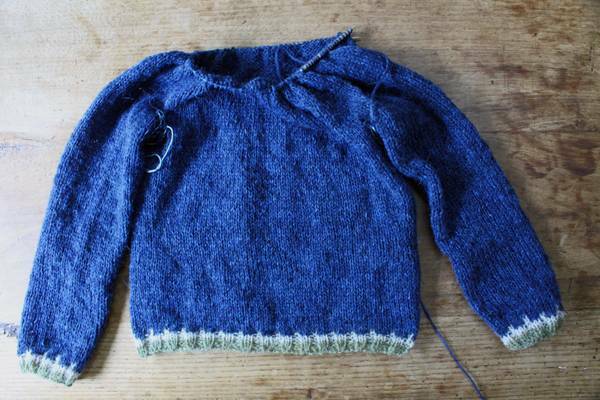 I alterted my neckline to be a rollover style – 8 rows of rib- then rolled to inside. Picked up same number of stitches on first neck row with separate needle, then loosely with 10 1/2 needle, did a three needle bind off. Beautiful!! Question? Why wait to kitchener? Why not to it first, after the tubes are complete, and the whole shebang is about to become one big circle.? The work would be flatter and perhaps less daunting to those who look on kitchener as a daunting but necessary adventure, and the ends could be knitted in (I am very big on knitting in ends as I go) during the round in which the big circle is created? I’ve never done that, but just wondering? I am busy banging out three other projects right now, so I am not banging out this one, but I would love to know if someone has tried this. I agree. Because at the end, the opening has stretched out some. Next time! Ellen, this is so obvious as to be embarrassing that I hadn’t thought of this. Feeling very literal over here–and heading over to do my kitchenering while I’m fresh ‘n’ caffeinated. Hm. 18 minutes on that Alabama Chanin project, too? Hey Ann, the un-yarn and Kitchner stitch are not happy companions. I recommend anchoring the yarn, holding the needle and twisting to get something resembling thread before attempting it. Maybe you’ve already figured that out. Your sweater is looking so lovely! It’s magic! I used to have to look up how to do it every time, but since the first time I tried this, it is locked in my memory, and I do it perfectly every time. I like a 3NBO for some things, but I am also a Frequent Grafter and enjoy it – as long as I put on my embiggening glasses first so I can see (and not split) the yarn, AND put a dish of food in front of my dog so she will be occupied. Kitchener/grafting makes actual simple sense to me – I mean, it’s moving the working yarn through the stitches in the same path as knitting would take, right? And we do that All The Time. I have a love hate relationship with Kitchener stitch. Love when it’s finished. Hate it in process. I’m in cuff down socks so one would think that practice would improve my performance, but no. Off to watch the tutorial. Yes! I love the magic of kitchener. I too learned from Knitty and practiced until I got it. Is it too late to join the Stopover Kal? Just finished a mkal and now have time. Looks like the sweater will go faster than a sock yarn lace shawl. I enjoy your blog so much, you and Kay are very inspirational (and enabling)! I’m OK with Kitchener Stitch – for some reason it seemed easier when I didn’t really know what I was doing early on my knitting life. I like the three needle bind off for a shoulder where you need more stability and the garment weight makes the pieces hang down. I completely agree on the magic of Kitchener. Finally, finally after umpteen socks I don’t have to think too hard about what I’m doing. And I love the story of its origins – necessity is the mother of invention! Oh my! I thought I was the only one in the world that loves doing the Kitchener stitch. What a delight to see others are in love with it too. My group of fellow knitters are of the 3 needle bind off set of mind, which is fine. But a nicely done Kitchener stitch is invisible, and that is magic isn’t it?! which credits him with the stitch (although a number of commentators in other websites share the view that a knitter invented it and he just took the credit). Although I always need to look up directions for kitchener, I agree with you, Ann. It’s not hard, it didn’t take much time & I like the outcome. It’s one of my magic knitting moments. And to me a three needle bind off is just as difficult if not more so. I’m not so deft or coordinated as many. I really wish the stopover neck worked for me…. But I’ll find something else. Eventually. I look forward to your posts ever day. Thanks for that. I too love kitchener! My chant as I work it comes from Susan B. Anderson’s great video: knit, off, purl; purl, off, knit. And then magic! I love to Kitchener too! I use the same Knitty tutorial. My problem with Kitchener is that even though I start with the same number of stitches on each side, sooner or later I end up with 13 on one and 5 on the other and I’m never quite sure what I’ve done wrong. Anyway, I made it work on my Stopover, and since we’re getting a nice cold rain here in OKC today, I am wearing it to work today. Yet another Kitchener/grafting devotee. I can’t remember “mantras” so I learned to intuit it early on, based on the appropriate path the yarn should take; this is made much easier if you know how to “read” your knitting. It always feels like magic. I have a deep fondness for anything that could make a “knitter’s puzzle” out of a project, including identical COs and BOs. I cannot believe all you folks are so in love with Kitchener, I HATE IT. I stopped knitting top down socks for this very reason. Give me a three needle bindoff any day. Annabel, I love 3NBO! I can kitchener, but I always have to look it up. I’m all for info that stays in my head. 3NBO FTW. And I knit my socks cuff down, but I decrease to about 8 sts and then run the yarn through the leftover sts and snug it up tight. Sew in end and I am done.